Say hello to my new favorite breakfast muffin recipe. Well, for right now anyway. 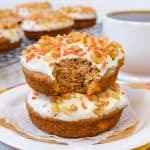 I adore these Carrot Cake Donuts, and these muffins reminded me of those yummy treats, but with a creamy cheesecake center. Oh, yeah. Our kids love having muffins that they can grab for a quick and easy breakfast before they head off to school. They also like having leftover muffins to munch on when they get home in the afternoon too. My original plan was to actually bake blueberry muffins because usually we have a big bag of blueberries in our freezer. Then I realized the last Triple Berry Orange Smoothie I made last week wiped out the rest of the blueberries. So, I had to get creative with what we already had. I looked through the cupboards and the refrigerator and came up with a big bag of carrots. 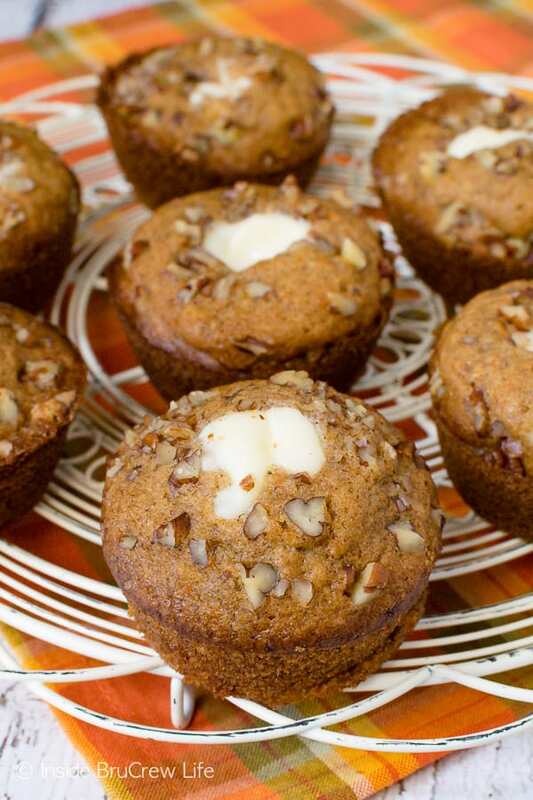 As I was working on the recipe for these carrot cake muffins, I had to make a few batches to get it absolutely perfect. 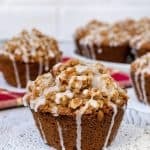 Carrot cake with cream cheese frosting is one of my all time favorite cakes, so it just made sense to make these carrot cake muffins with a cheesecake filling. After a few test runs on these carrot muffins, I doubled the cheesecake center because more cheesecake is never a bad idea. Am I right? Shred your carrots using a food processor or with a hand held grater. Do NOT buy the all ready shredded carrots that are available in the stores. These do not provide enough moisture for baked goods. Mix your oil, sugars, extract, and eggs in a large bowl. Stir together all the dry ingredients and slowly mix them into the sugar mixture. Add the buttermilk and carrots and stir until mixed in. Divide the batter evenly into 18 greased muffin cavities. You will need a 12 count pan and a 6 count pan. 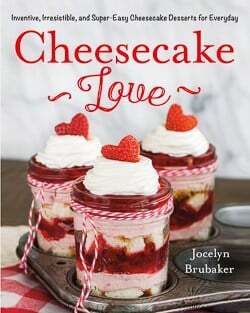 Beat together the cheesecake filling and spoon it into two large plastic baggies. Cut one tip of each bag. Use one bag to squeeze cheesecake into the center of the muffin batter. Use the second bag to go back over each muffin and add another swirl of the cheesecake batter on top of the muffins. Sprinkle the outside edges with diced pecans. This is totally optional, but it really makes the muffins look a little prettier and taste so good. 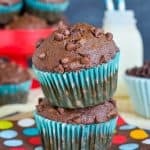 Our kids request these Double Chocolate Banana Muffins all the time! These Coffee Chocolate Chip Muffins are a great way to start each morning. 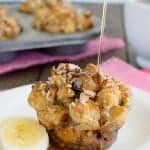 These Grab N Go Pancake Muffins from All Day I Dream About Food are perfect for busy mornings. 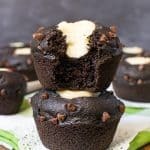 A batch of these Chocolate Avocado Muffins never last long in our house. Trust me and make these today! 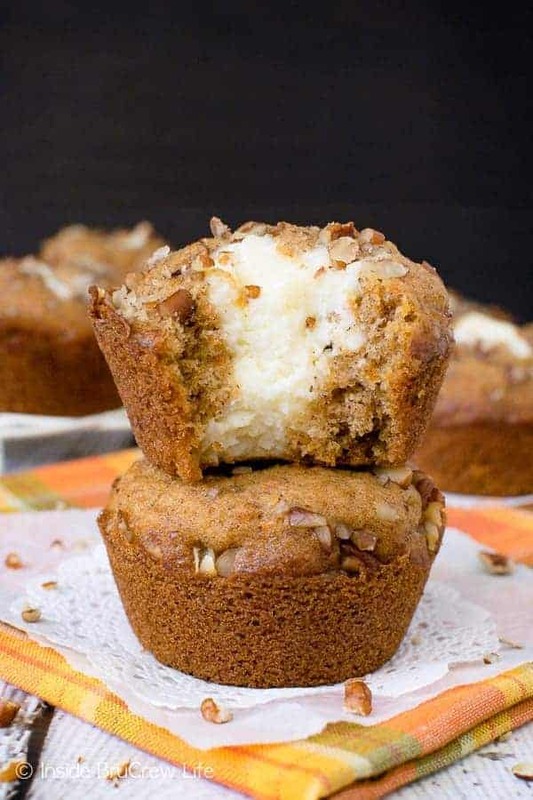 These sweet Banana Coconut Muffins are loaded with shredded coconut and toffee bits. They are so good. Preheat the oven to 400 degrees. 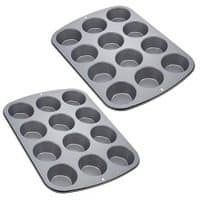 Spray a 12 count muffin pan and a 6 count muffin pan with nonstick baking spray. Beat the oil, sugars, and extract until combined. Add the eggs and beat again. Stir together the flour, baking powder, baking soda, cinnamon, nutmeg, anise, and salt. Slowly add the dry ingredients into the egg mixture. Add the buttermilk and shredded carrots and stir until completely combined. Spoon the batter evenly in the prepared muffin tins. In a small bowl, mix together the cream cheese, sugar, orange extract, and flour. Spoon the mixture evenly into two large plastic baggies and cut one tip off each bag. Squeeze half the cheesecake mixture evenly into the center of the muffin batter. Use the second bag of cheesecake to add a swirl of cheesecake to the top of the batter. Sprinkle the pecans around the outside of the muffin batter. Bake for 15-16 minutes. Remove and let cool in the pan for 2-3 minutes before gently removing them from the pan and placing on a wire rack. 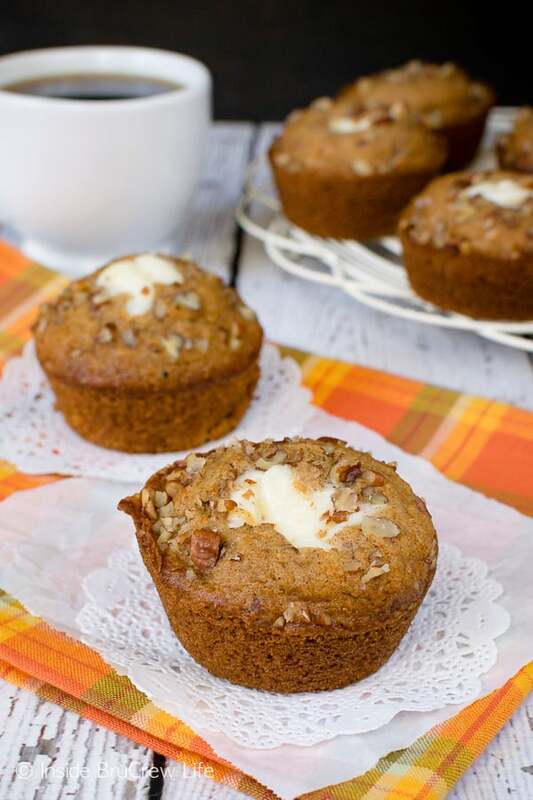 *The post for Carrot Cheesecake Muffins was originally published on September 24, 2012. The photos and post have been updated and republished on March 25, 2019. Perfect choice for Secret Recipe Club this month. These look incredible and I know I will be making them soon. Thanks, and I hope you enjoy trying them!!! Carrot & cheese cream, always a delicious combination. Love the twist to the flavours. thanks…it was a fun combo!!! Yum! Those are perfect for fall! These look great! I have made a version with pumpkin, but am going to have to try the carrot!! Delicious! I love pumpkin and cheesecake together too…yum!!! 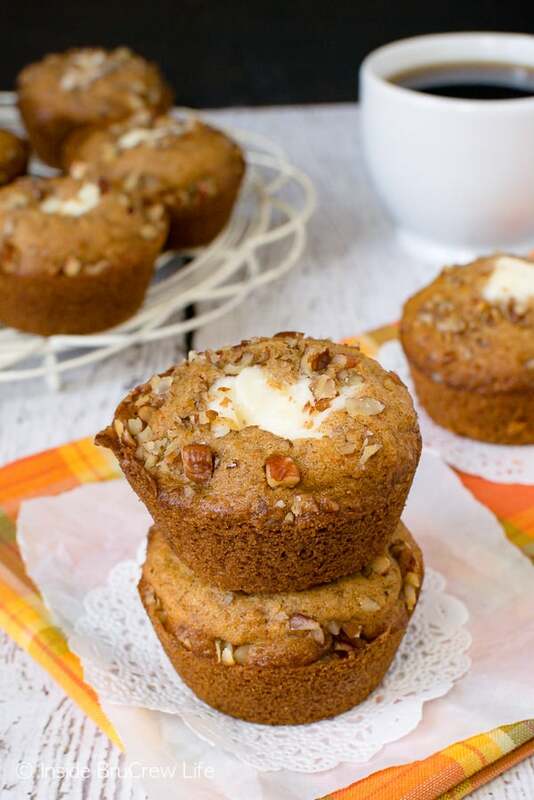 You can’t go wrong with carrot and cream cheese in a muffin! Looks delicious girlfriend!! Nice choice and way to improvise! Great combination of flavours and great improvising with the ingredients! Happy SRC reveal day! 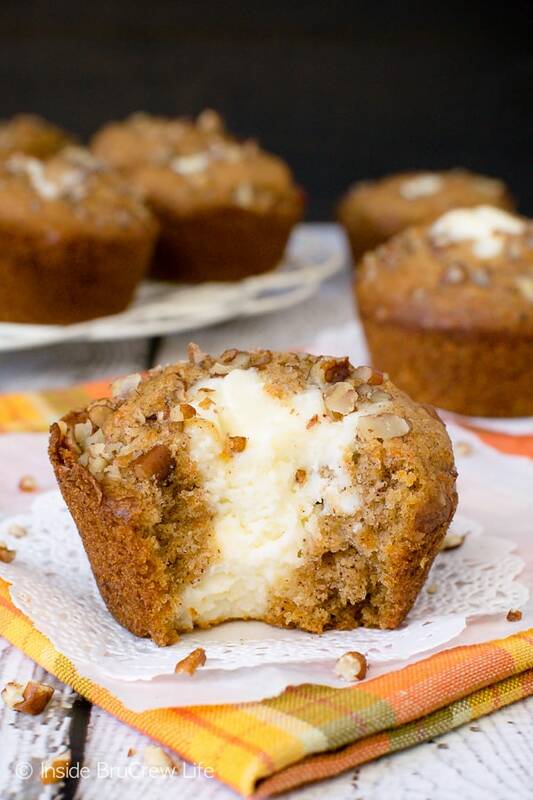 I love carrot carrot cake and cheesecake, so I imagine making them both into muffins would be absolutely delightful! It is quite the combo…so good!!! Oh, how I love it when you post carrot cake recipes. Because it’s more ammo against my husband. Ha! 🙂 Love these! Oh… I am so going to make those! These sounds amazing! Carrot cake and cream cheese are such a beautiful pairing! 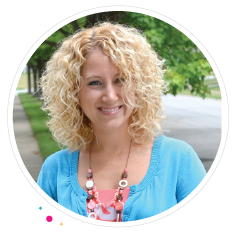 So looking forward to trying these — great post! These look wonderful! I love that you made a Cinnamon Toast Crunch streusel out of it. YUM! YUMMY! I too have had to “convert” a few times and was a bit nervous, but it always turned out. Yummy that looks amazing!! I love carrots and cheesecake!! great twist on the original recipe! cinnamon toast crunsh is my favorite cereal. Love how the milk gets all cinnamony and sweet. These did not turn out for me. Terrible. But it could just be me. I am so sorry to hear that these didn’t work for you. Every oven is different…I wonder if that had something to do with it. These muffins are incredible! I could eat them EVERY DAY! This is a brilliant idea! It’s like carrot cake with cream cheese frosting for breakfast! I really loved these muffins! Perfect day starter! LOVE these muffins! And the kids did too!